Who knew that when I saw these Candy Corn Flavored Oreos a few weeks ago at Target that I would not find them again. I really was not yet thinking of Halloween but thought I would bring them home for inspiration! Once I was in the Halloween mood, I started getting ideas on what to do with them, and since they are a smaller box than your traditional box I realized I needed more to make a full recipe of Oreo Truffles. Well needless to say, I decided to do something with them anyway since in another month people would shy away from you serving them and my family sure does not need them all to themselves. So I thought I would share this oreo recipe. I started thinking of bark but remembered my sister used to make pretzel bites around the holidays with chocolate and pretzel sticks. I made monster pretzels a few years ago. 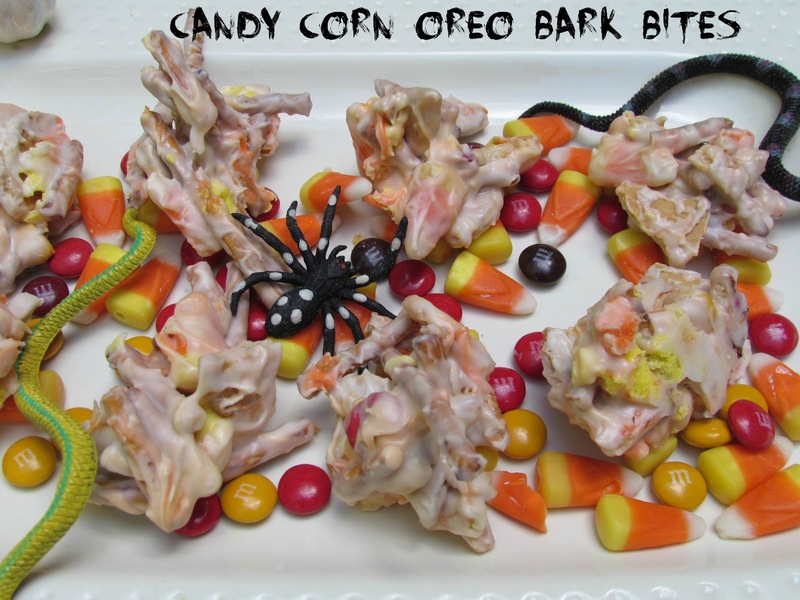 So why not add all the other flavors of Candy Corn Oreos, pretzels candy corns and M and M’s right into a mound. Well, not the best technique as the candy corn started melting its color into the chocolate and I probably added too much to the chocolate so they all did not stay completely together. However, let me tell you, WATCH OUT FOR THE SUGAR RUSH! These things are sooo sweet they will blow you away. Do not give these to children before bedtime unless they are not yours and you can send them right back home!! If you jazz up the presentation doesn’t any candy look good for Halloween? You only need one and a big glass of water but this is Halloween season and my diet goes to pot from now until Valentines Day really. But I have fun making the creations and sharing them with my blog friends as well as my neighbors and friends locally. I had a few oreos left so I decided to make Candy Corn Oreo Bark the more traditional way. Just layer your ingredients such as pretzels, peanuts, broken oreos,in a pan that has a sheet of wax paper or parchment. Melt your chocolate preference, I used white chocolate and then gently press in the sprinkles, candy corn and M and M’s into the chocolate as it spreads over the first layer. Allow to completely cool and then break it into pieces. Flavors are comparable but looks are a winner. I think more folks would go for the bark on a dessert table but what do you think? Which is your favorite? Be sure and come back Friday for Friday Food Frenzy that will be themed to share your Halloween goodies! Mix all the ingredients in a bowl then pour the chocolate over it. Drop spoonfuls onto parchment paper and let cool completely. Here is the recipe from My Baking Addiction for the Bark. 1. Line an 8×8 baking sheet with parchment paper. 2. Spread the cookies, pretzels and peanuts into the bottom of prepared pan. 3. Melt chocolate in a bowl set over a pan of simmering water, or in the microwave at 50% power, stirring frequently until almost melted. Remove from the heat while there are still a few pieces of un-melted chocolate; stir until smooth. 4. Drizzle chocolate with a spoon over the goodies in the pan, spreading the top flat to coat evenly. 5. 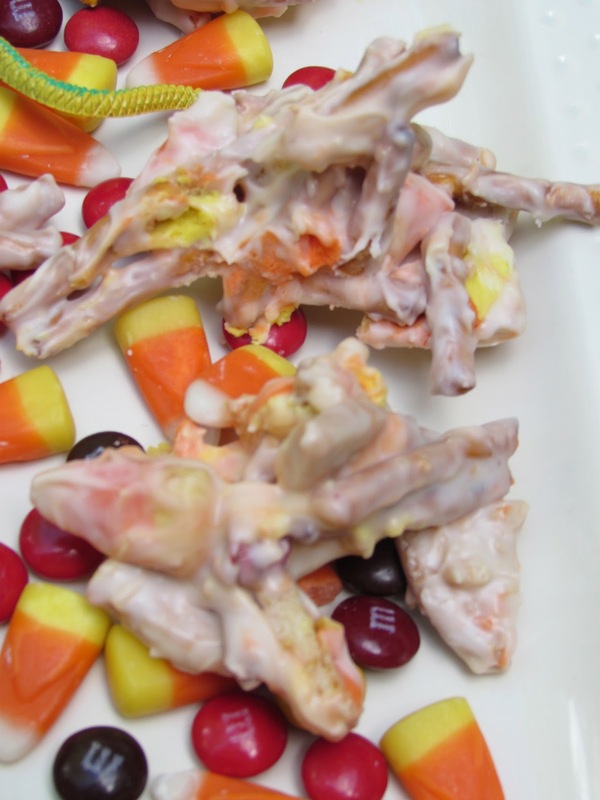 Top with candy corn and sprinkles. Let cool until firm. Break into pieces and store in an airtight container. We don’t get all of the fun Oreo flavours in Canada. These look so fun, but alas no luck for us! Thanks for sharing your neat recipes! Looks great. The kids will love it! Looks really good. I’m kinda scared of all the sugar it might have lol. I haven’t been able to find those oreos! They look so good! This looks SO yummy! Love that you included pretzels! OK, OMG! 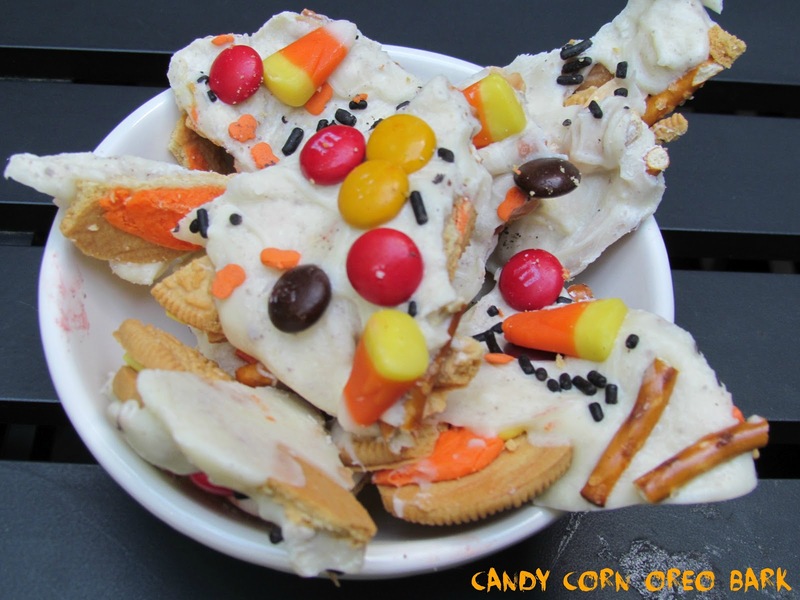 1st things first…CANDY CORN OREO’s … YES!!!!!!! These look super good, I’d have to do a pretzel batch and a non, IM the only one who likes them in our family!! The second recipe looks much better but I’m sure my family would go insane over either! I cannot find these Oreos and its driving me crazy!